As wattages increase in high-density server applications, providing redundant power becomes more challenging and costly. Traditionally, the most practical solution for distributing redundant power to 208V server racks above 5 kW has been to connect dual 3-phase rack PDUs to dual power supplies in each server. Although this approach is reliable, there is a better way. 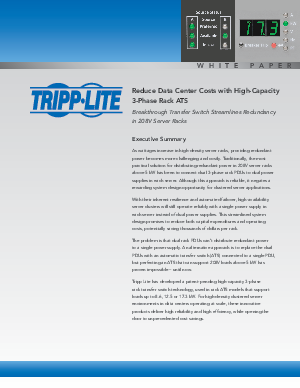 Tripp Lite has developed a patent-pending high-capacity 3-phase rack ATS specifically designed to deliver efficient, reliable redundant power to high-density clustered server environments.